The Big Idea: Observing animals that camouflage will help build kids’ capacity to focus and take in detail. Print this page and grab a pencil or crayon. Then, head outside (or online) to find animals that camouflage (blend in with the environment and space around them). Look closely at the grass for any animals that blend in. Do you see ants crawling on soil? Look up at the branches of trees. Do you see any brown birds camouflaging in the bark? If you’re inside, try searching online to find animals that camouflage in all different environments. What animals camouflage with snow in a cold environment? What animals camouflage with sand on a beach? 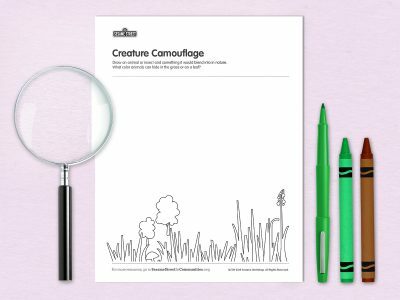 On the printable page, draw some of the animals you see camouflaging.